Other Products by ATP Science. Search other Acetyl L-Carnitine products. Vegan-Friendly, GMO Free and Gluten Free. ATP Science Acetyl L-Carnitine is a high quality pure acetyl-l-Carnitine powder- an acetylated version of L-Carnitine. L-Carnitine is a dipeptide, meaning that it is composed of two amino acids, in this case methionine and lysine. However, these two amino acids are in fact termed essential, which indicates that we can not synthesise them endogenously. Therefore, our dietary levels of these two amino acids will tend to reflect the levels in our bodies, which was demonstrated in research all the way back in the year 2000, and published in a journal called Physiological Research1. However, even with an adequate dietary intake of these two amino acids, numerous clinical trials indicate that supplementation with carnitine, such as the acetyl-l-carnitine found in ATP Science Acetyl L-Carnitine, has numerous beneficial effects. Furthermore, some of the benefits of acetyl-L-carnitine may be attributed to the acetyl group, which means that, depending on the results we seek, the acetyl form may be superior to standard Carnitine preparations. Carnitine has an important biological use, which is not surprising given that we express the appropriate enzymes to synthesise this dipeptide, using up two important essential amino acids in the process. After all, the body has limited essential amino acid resources. Carnitine transports long-chain fatty acids from the cytosol—the "space" inside the cell—to the mitochondria, where they undergo oxidation via beta-oxidation. This process is important in supporting the generation of ATP or energy, through oxidative phosphorylation. So the trade off is more enegy and less fat. Few would be disappointed with this! However, one would have to ask the question, with a normal dietary intake of precursors, does supplementing with more lead to additional benefits, or is the process of long-chain fatty acid transportation in providing precursors to beta oxidation saturated at a relatively low physiological carnitine concentration... well, this is the question the author had asked himself for some time. However, a review and meta-analysis indicated that there was an extra weight loss of 1.3kg when weight loss programs included carnitine supplementation, with more benefits gained the longer the product was used2. Furthermore, acetyl-L-carnitine has demonstrated neuroprotective (nerve/brain protection), antioxidant and anti-depressant activity3. This may be by increasing energy or ATP availability within neurons. However, the acetyl group donation seen with products like ATP Science Acetyl L-Carnitine may allow for increased acetylcholine synthesis, a neurotransmitter found in the brain and associated with learning and memory4. Acetyl-L-carnitine has also been shown to reduce muscle soreness after exercise, perhaps by improving blood flow and oxygen supply during exercise5. Carnitine has also been shown to increase muscle mass and decrease body fat levels, as well as reducing physical and mental fatigue in older adults. Carnitine is a dipeptide, beneficial for a great deal more than simply burning fat, and an important part of anyone wanting to support general health or enhance body composition and exercise recovery. ATP Science Acetyl L-Carnitine is a clean and completely vegan supplement that can be taken daily to boost your levels of this exciting and therapeutically-potent dipeptide. 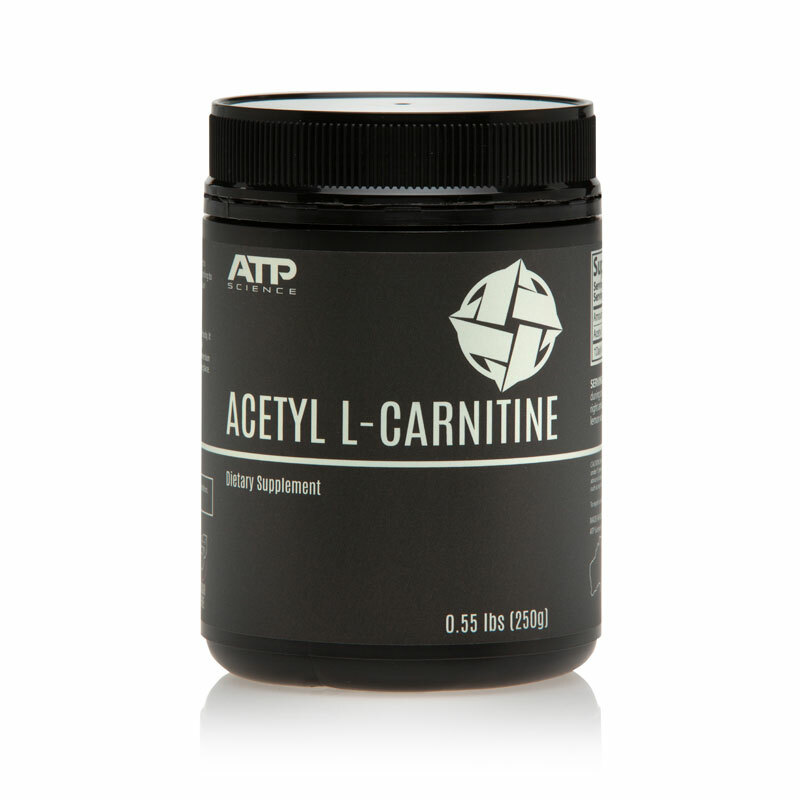 For optimal results take 2g of ATP Acetyl L-Carnitine before, intra or directly post-workout. Alternatively, take first thing in the morning.